58794/58707, CENTER CAP Used, 18", 06-10, AUDI, A8, DARK GRAY, RAISED CHROME LOGO, PLASTIC CLIPS & WIRE RING, GUIDE PIN, 2-1/4" DIA. Price: ORDER UNDER 58707 CENTER CAP. 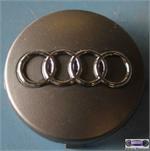 58794/58707, CENTER CAP Used, 18", 06-10, AUDI, A8, dark gray with raised chrome logo. plastic clips & wire ring & guide pin. 2-1/4" DIA., FOR A USED RIM,, ALUM, MED GRAY, 5 WIDE SPOKES, EXPOSED LUG NUTS. ORDER UNDER 58707 CENTER CAP.